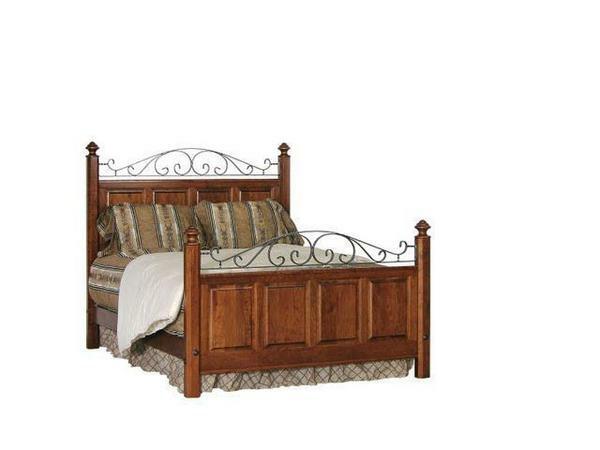 This solid constructed iron and wood panel bed has the look of a vintage antique bed. The beautiful iron curves create a romantic look in the bedroom. This bed is Amish handcrafted in Lancaster County, PA in your choice of oak, cherry or maple wood. You can choose either a twin, full, queen, king, or california king size bed to perfectly fit your bedroom suite. Our beds are built for each customer and can be customized. Please call 866-272-6773 to speak with one of our Amish furniture specialist who can answer your questions or help you place your order for your new Early American bed! This bed takes about 8-12 weeks to complete.